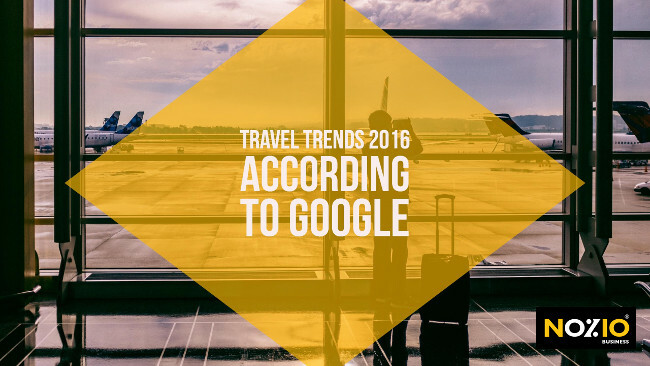 As it does every year, Google has published the results of its research on tourism in orde to share the changing digital habits of travelers, with the market. Thanks to the huge amount of data in its possession, Google manages to provide us with detailed results and accurately define the users’ online purchasing process. Its research provides confirmation of topics already shared on this blog, that is, the growing expansion of mobile technology for searches linked to traveling and the increased viewing of You Tube videos. As we have said many times, mobile devices are the most popular devices used by travelers searching for travel and lodgings. On the other hand, most of the bookings are still concluded from a desktop device. The weekend is the most popular period for travelers searching online for all the information they require. The graph shows us how there is a net increase, on Saturdays and Sundays, in mobile searches made on the 5 most popular destinations on the Google search engine, (Reykjavik, Havana, Toronto, Mexico City and Tokyo) by US travelers. It is probably no coincidence that most of the bookings are concentrated midweek and drop off at the weekend when travelers are busy searching. Managing the stage that Google calls, “Time-to-make-a-plan moments”, is essential for positioning the hotel as a possible solution for the trip to be undertaken by travelers’, at the point when they are ready to make their purchase. Smartphone, always at the ready in your pocket! Technology is gradually eliminating the traditional printed travel guides and smartphones are becoming the most important tool, not only at the pre-departure stage but also during the trip. 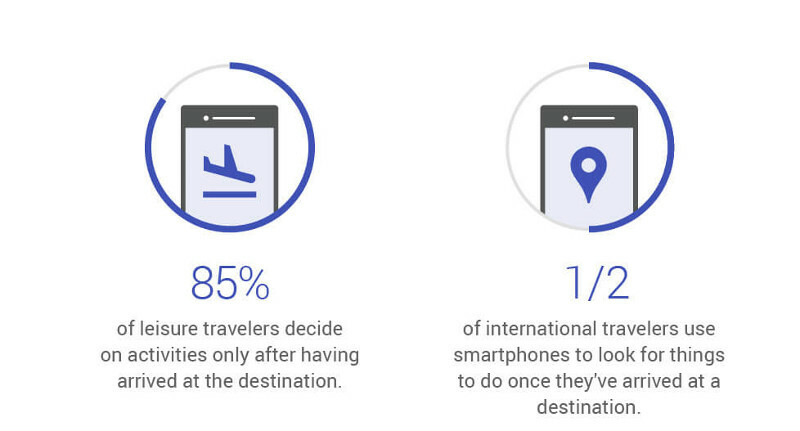 It emerges that 85% of travelers only decide what to do when they arrive in loco and half of international American tourists use their smartphone to make decisions. The research confirms that You Tube plays an increasingly important role at the planning stage of travel, that is, “time-to-make-a-plan moments”. It emerges that the video content focuses mainly on the subject of “travel hacks”, that is, tricks and travel tips on how to prepare your luggage, avoid suffering during long airplane flights or find the best deals online. 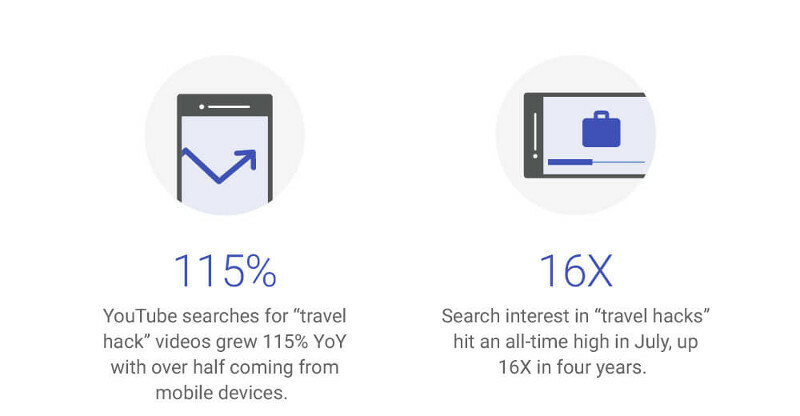 Searches for the keywords, “travel hacks” on YouTube show an increase of 115%, with more than half of the research carried out via smartphones, especially during the period prior to summer departures. Developing a hotel marketing strategy that involves mobile and video content is an opportunity to stand out from the competition, deal with the continuous evolution of consumer habits and intercept the most interesting travelers in your hotel. Discover ATTRACT» CONVERT» SHARE, the strategy aimed at dealing with the traveler’s entire purchasing cycle and increasing the direct sales quota via Official Hotel websites.